Nokia N96: 103mm high, 55mm wide and 20mm thick, weighs 125g. iPhone 3G: 115.5mm high, 62.1mm wide and 12.3mm thick, weighs 133g. Nokia N96: 2.8" QVGA non-touch display. iPhone 3G: 3.5" multi-touch display. 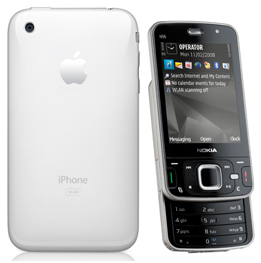 Nokia N96: S60 3rd Edition, Feature Pack 2.
iPhone 3G: The iPhone runs on OS X, which is Apple's very own operating system. Nokia N96: 16GB, plus a hot swappable microSD memory card slot. iPhone 3G: 8GB and 16GB, with the latter available in both black and white. Nokia N96: 5.0-megapixel camera with Carl Zeiss lens and inbuilt flash, video is shot at 30fs at a 640 x 480 resolution. iPhone 3G: 2.0-megapixel camera, with geo-tagging and third-party application integration. Nokia N96: The N96 plays MP3, AAC, eAAC+ and WMA audio formats. Meanwhile, the video player can handle MPEG-4 and WMV9. A major bonus with the handset is the DVB-H capabilities, as it has an internal antenna. iPhone 3G: The iPhone's main thrill is indeed the iPod functionality, and with 8GB or 16GB options, that's a lot of AAC, Protected AAC, MP3, MP3 VBR, Audible (formats 1, 2, and 3), Apple Lossless, AIFF, and WAV. Video formats supported are H.264 video, up to 1.5 Mbps, 640 by 480 pixels, 30 frames per second, Low-Complexity version of the H.264 Baseline Profile with AAC-LC audio up to 160 Kbps, 48kHz, stereo audio in .m4v, .mp4, and .mov file formats; H.264 video, up to 768 Kbps, 320 by 240 pixels, 30 frames per second, Baseline Profile up to Level 1.3 with AAC-LC audio up to 160 Kbps, 48kHz, stereo audio in .m4v, .mp4, and .mov file formats; MPEG-4 video, up to 2.5 Mbps, 640 by 480 pixels, 30 frames per second, Simple Profile with AAC-LC audio up to 160 Kbps, 48kHz, stereo audio in .m4v, .mp4, and .mov file formats. Nokia N96: 3G HSDPA, plus integrated Wi-Fi and Bluetooth. iPhone 3G: 3G HSDPA, plus integrated Wi-Fi and Bluetooth. Nokia N96: GPS and A-GPS, plus Nokia Maps application. Nokia N96: Close to four hours' talk time, stand-by is 220 hours, video playback is five hours, music playback 14 hours. iPhone 3G: Up to five hours of talk time using 3G, or 10 hours using 2G, standby is 300 hours, five hours of 3G internet use and six hours of Wi-Fi internet use, seven hours of video playback and up to 24 hours of audio playback. Nokia N96: Still unknown, however Play.com has revealed they'll have it in stock on July 31st, for £599. iPhone 3G: Out on July 11th, you can get it for free on £45 and £75 per month tariffs, or £99 on the £30 and £35 per month plans. With O2, of course.